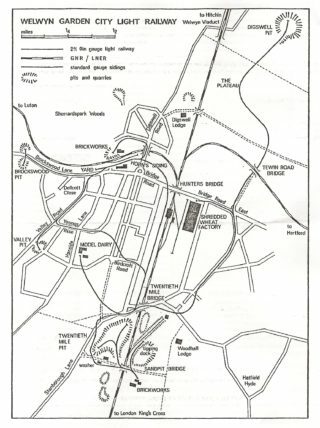 In the early days of building Welwyn Garden City, there was an immediate need to provide its builders with the necessary building materials such as sand and bricks. A lot of the basic materials were extracted from local sites but transport around the area was difficult due to the poor quality of the roads which were mostly farm tracks subject to mud and flooding. To overcome this problem, a light railway was created. 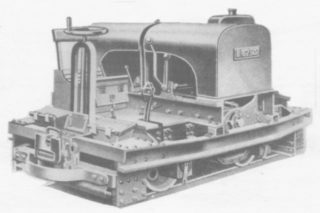 A Captain W E James, formerly of the Royal Engineers, was appointed Resident Engineer to the original founding company and much of the light railway work was undertaken at his direction. It was based on his own experiences during the First World War in northern France where light railways had been used to bring ammunition up to the front in almost any weather. At the time, the nearest railway stations that could be used to deliver materials were at Ayot and Hatfield GNR stations, but there was a small siding for farm produce at Upper Handside Farm, known as Horn’s Siding after the occupants of the farm, which was considered to be more convenient. The area is now known as The Campus. Captain James adopted this area, lengthened the sidings and this became the first supply depot for the town. The first goods to be received were a batch of fifty sinks for scullery use. Bricks, pipes and all paraphernalia for building started to arrive shortly afterwards. Initially, onward distribution was by horse and cart until April 1920 when the first bricks for houses in Handside Lane were laid. The light railway came into operation at about this time. At first there were two ex War Department locomotives, 20hp Simplex locomotives, to be soon followed by three more as the pace of building accelerated. The narrow gauge railway ran alongside the large gauge at Horn’s Sidings and transported building materials that were brought in from outside on the wider gauge railways and also took aggregates from small sand and gravel pits in both Brockswood Lane and Valley Road. A number of other sites were used for extraction, the largest being what is now the Gosling Sports Stadium. A map of the light railway shows the extent and the area covered. It was also used to transport manure from the Model Dairy in Handside Lane (now The Barn Theatre) to the agricultural areas for use as fertiliser. The light railway lines were moved from time to time as the location for building changed. By 1926, the Welwyn Garden City railway station opened and three years later, the light railway was in decline as more flexible lorries came into greater use. The light railway was finally removed in 1936. This page was added on 28/11/2010. There was a piece of the light railway track that ran from the old Stanborough Lane across the gravel pits road near where the Gosling Stadium now is. It ran towards the railway bridge and there was the remainder of a large gravel washing structure there. The stadium site was a very large unfenced hole filled with water. There was another short piece visible adjacent to where the track from Bridge Road runs across the level crossing on the Luton railway line. This was late 1950’s. I remember that, for many years, there was still some track of the Welwyn Garden City Light Railway visible across the entrance to what was then British Lead Mills in Peartree Lane where, according to Google Maps, Master Chef and The veterinary Centre are today. I seem to remember that this track included a set of points, but it was all solidly set in concrete up to the level of the top of the rails. I think there was also some track that crossed the old Stanborough Road (which now looks like it is a cycle-way) a short distance south-west of Lemsford Lane. This was back in the 1950’s and early 60’s, and has now, no doubt, long since gone.